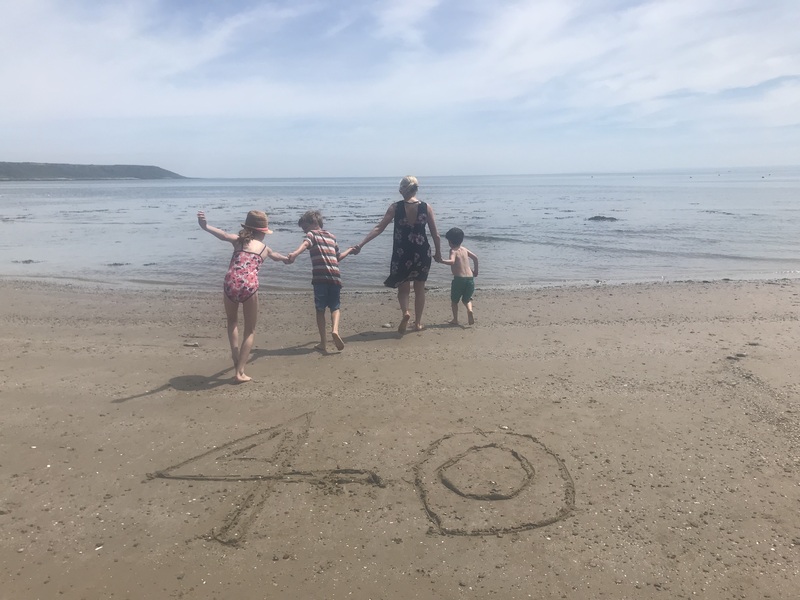 I wasn’t bothered about having a big celebration for my recent 40th birthday. The age thing didn’t worry me; I just didn’t really want a huge party. 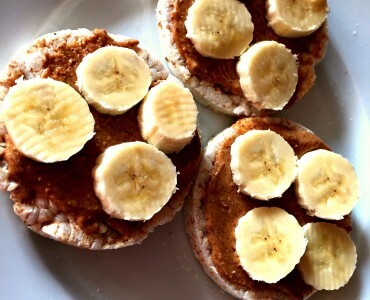 But with so many friends pulling out all the stops for their 40ths I was beginning to feel the pressure to do the same. But then two things happened. Firstly my children’s school summer fair was scheduled for my birthday weekend. 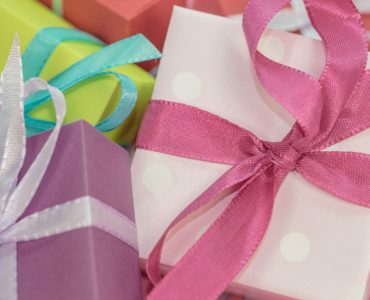 I’ve spent at least four of my birthday weekends at the school summer fair (on one occasion it fell on my actual birthday and my children wanted to take me there for a “surprise” that I had to pretend I didn’t know about) and unless they change it from always being the same particular weekend in June that’s where I’m likely to spend my next seven birthday weekends. As wonderful as my children’s school is, I just didn’t want to spend my big weekend selling cakes or sticking glitter tattoos on excited kids. The second thing was that Ed Sheeran announced four huge concerts at the Principality Stadium over my birthday weekend and I knew firstly that there would be no point trying to go anywhere in Cardiff that weekend because the city would insanely busy and secondly half my friends would be at his shows in any case. 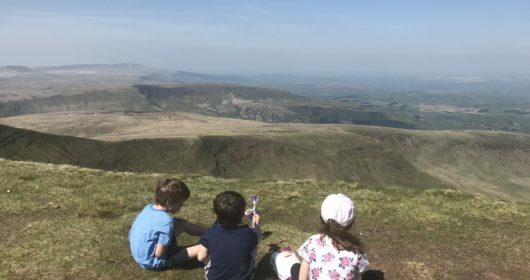 “I just want to get out of Cardiff and escape to the middle of nowhere with you and the children,” I told Cardiff Daddy. 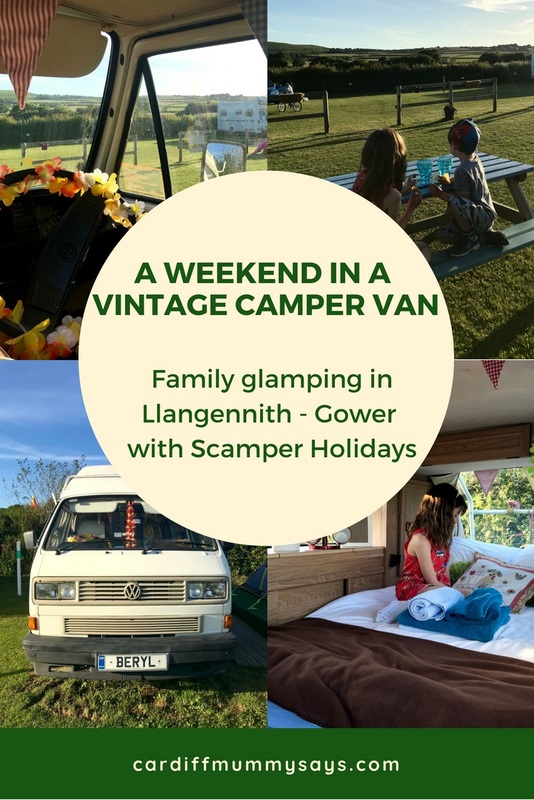 And that’s exactly what we did with a beautiful weekend glamping in Gower thanks to Scamper Holidays. The Gower peninsular is one of my favourite places in the UK. 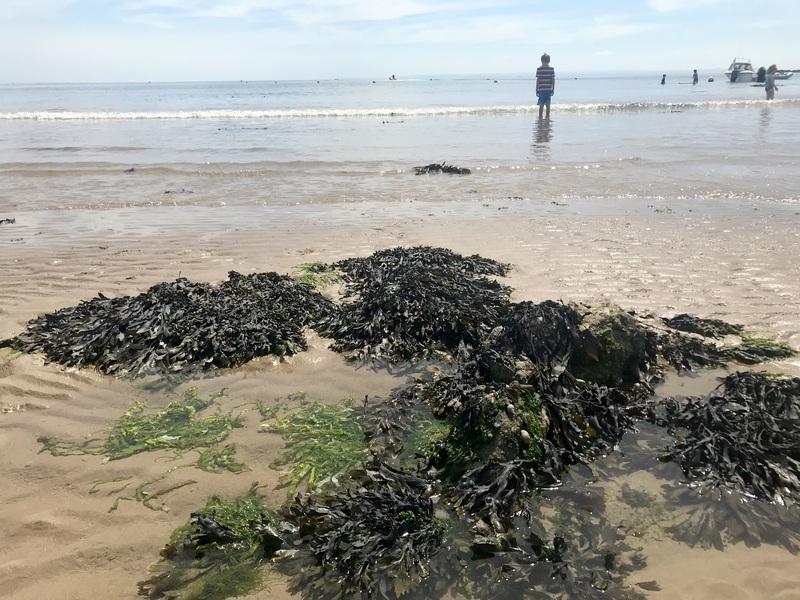 Home to world-class, award-winning beaches, cliffs, dunes, marshes, wooded valleys and farmland, it was designated the UK’s first Area of Outstanding Natural Beauty in 1956. 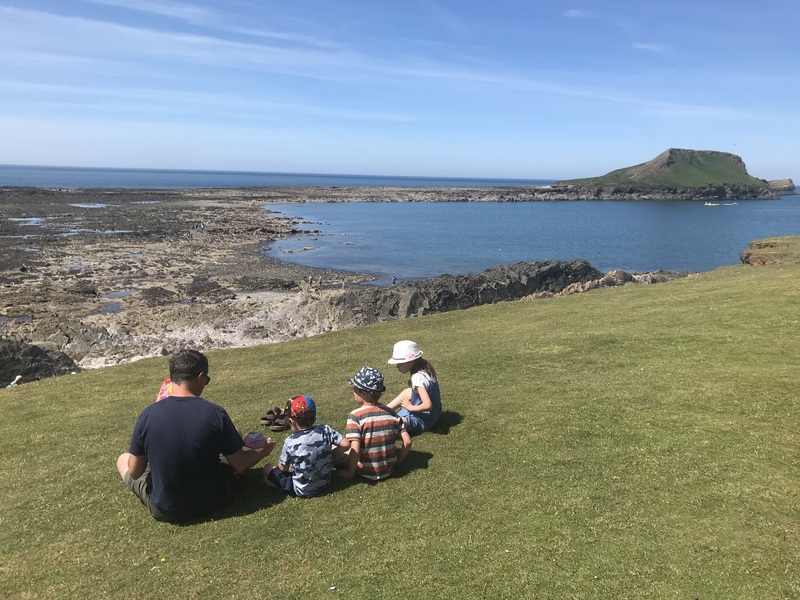 I have happy memories of childhood trips to Gower, as well as beach trips while I was a student at Swansea University… including some with Cardiff Daddy in the early days of our relationship. 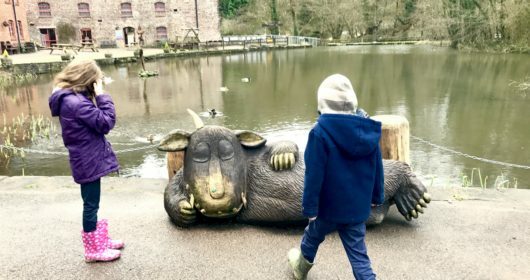 Around an hour and 20 minutes from Cardiff it’s really accessible for a weekend away. 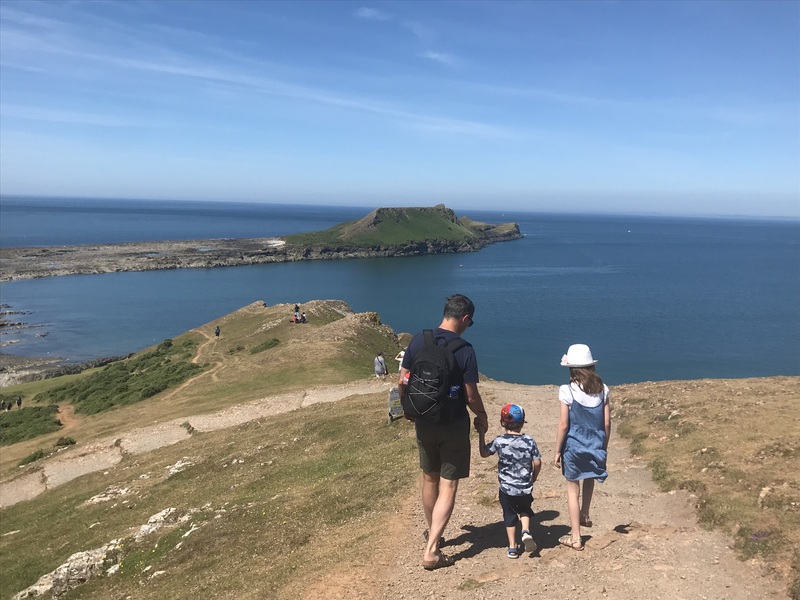 And even though it is home to incredible beaches such as Caswell, Three Cliffs Bay, Langland, Llangennith and Rhossili it doesn’t have the same crowds of tourists as Devon or Cornwall, making for a far more pleasant holidaying experience. I couldn’t think of a better place to spend the last weekend of my 30s. 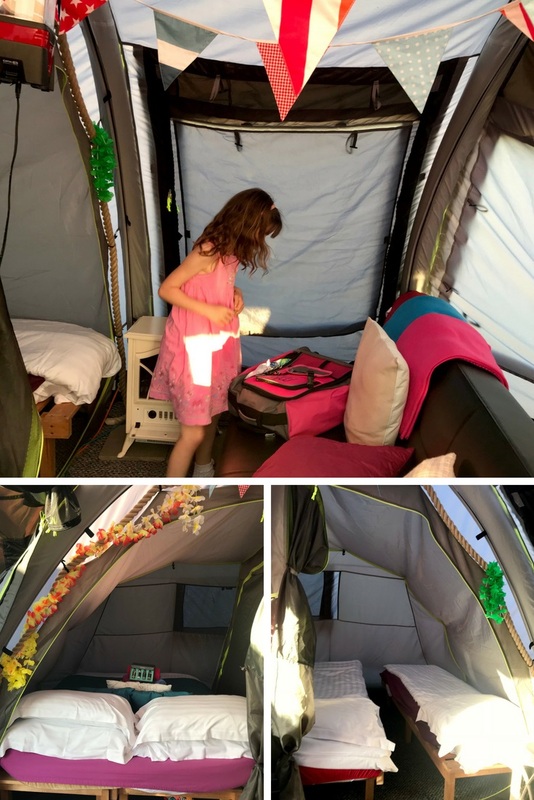 Scamper Holidays is a family glamping business run by Mark and Kathryn Boulson. They have two family (and dog!) friendly sites on the Gower peninsular. 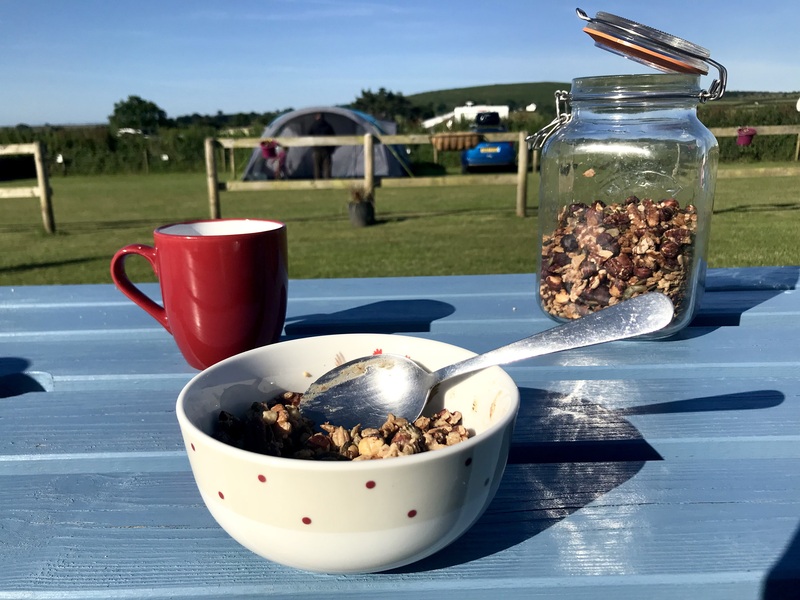 One is at Pitton Cross Camping and Caravan Park just over a mile from Rhossili Bay, which was named Wales’ Best Beach 2018 and third in the UK in the TripAdvisor Travellers’ Choice Awards. 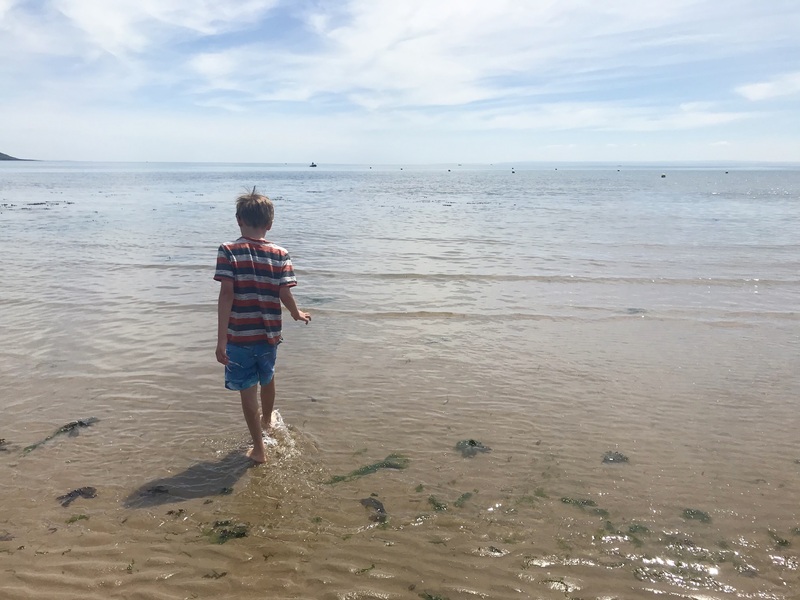 The second – where we stayed – is at Kennexstone Camping and Touring Park near Llangennith, another world-class beach popular with families and surfers. Each is home to several quirky glamping pods including classic shepherd huts and tiki lodges. When we arranged our review trip back in April I was fully prepared that we might be spending a weekend in the pouring rain. But as it happened, we were treated to the most glorious sunshine and we had such a perfect family break away. It was a chilled out, technology-free weekend, with plenty of al fresco dining, kids running around outside until 10pm with friends they had made in the neigbouring glamping pods and tents, day trips to the beach at Port Eynon, a walk to Worm’s Head at Rhossili, and a lovely meal in the picture-perfect beer garden at the Britannia Inn. I couldn’t have asked for a more perfect end to my 30s. 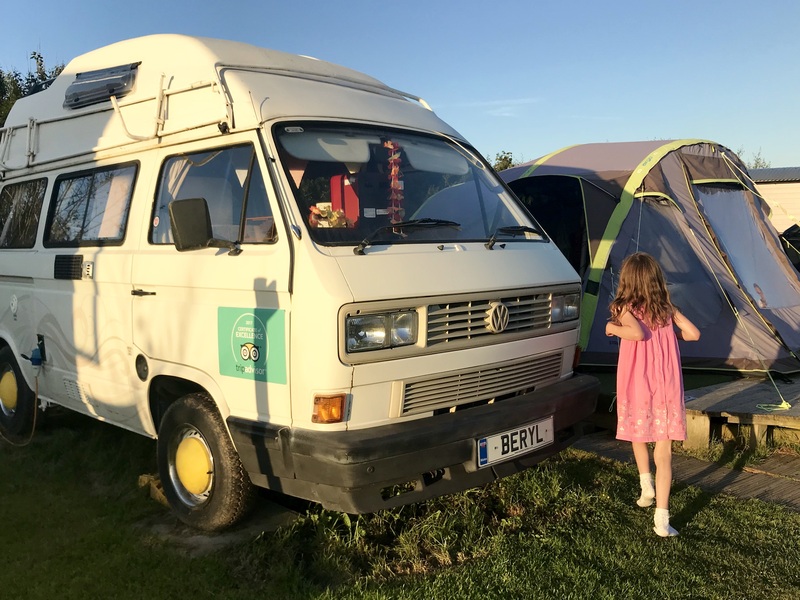 We left Cardiff after school on the Friday and were greeted on arrival by Sophie, the friendly and knowledgeable site manager, who showed us around the site and to our home for the weekend – Beryl, a vintage VW camper van attached to an air tent. 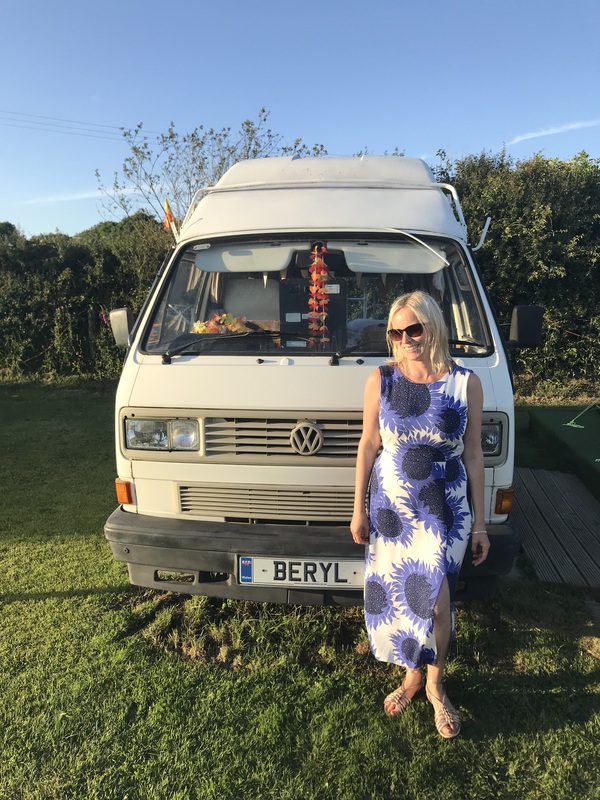 My children instantly loved Beryl and couldn’t wait to see inside. 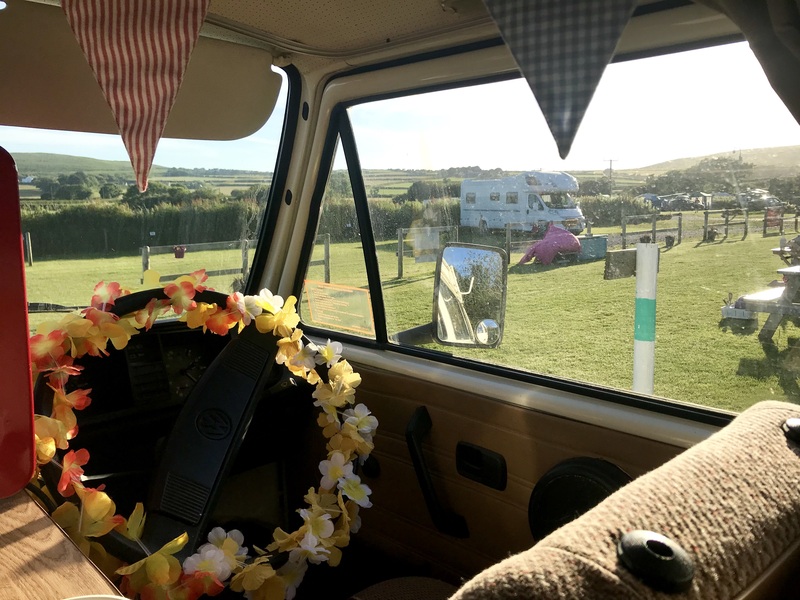 Decorated with floral garlands, pastel bunting and cushions, she sleeps six, with two in a classic campervan double bed and up to four in the tent. The tent was a lot more spacious than it looked from outside. 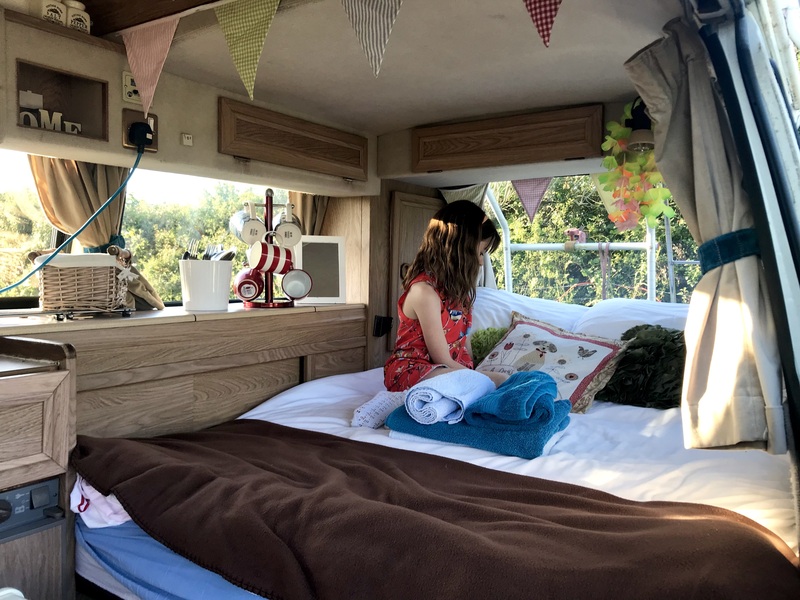 It sleeps four with a double off-the-floor bed and two singles in different partitioned ‘room’ areas, as well as a large settee, a fridge and an electric plug socket. Bedding and towel bales are all included in the booking, which we thought was a lovely touch when so many companies charge extra for these packages. 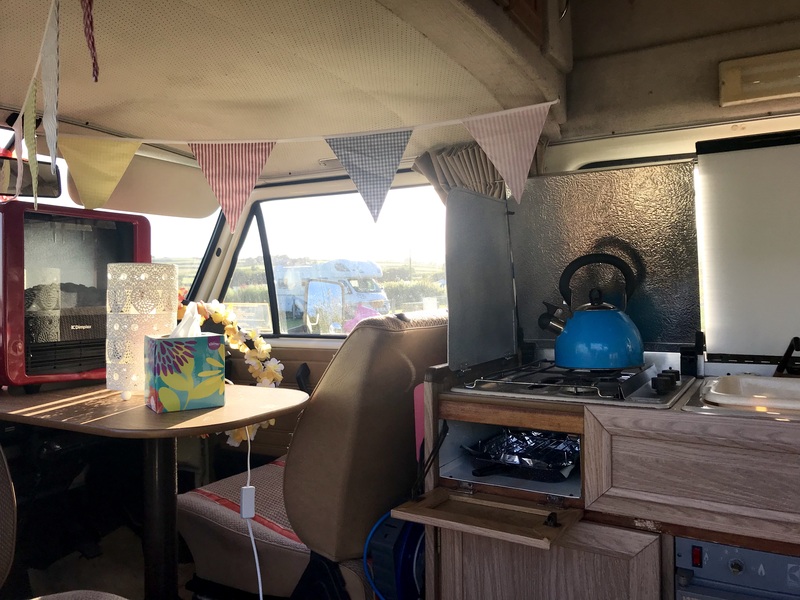 The camper van’s kitchen was basic but perfectly manageable with a small fridge, gas cooker with two hobs and a grill, and a foot-pump operated sink with cold water. It was well-stocked in terms of crockery, cutlery and utensils, plus we had our own gas barbecue on our pitch too. 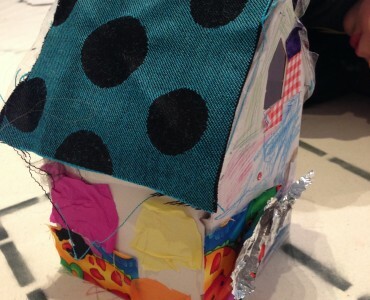 We had a sneak peak at some of Scamper’s brightly coloured wooden tiki huts, which offered a more luxury option with full-size ovens and TVs inside. 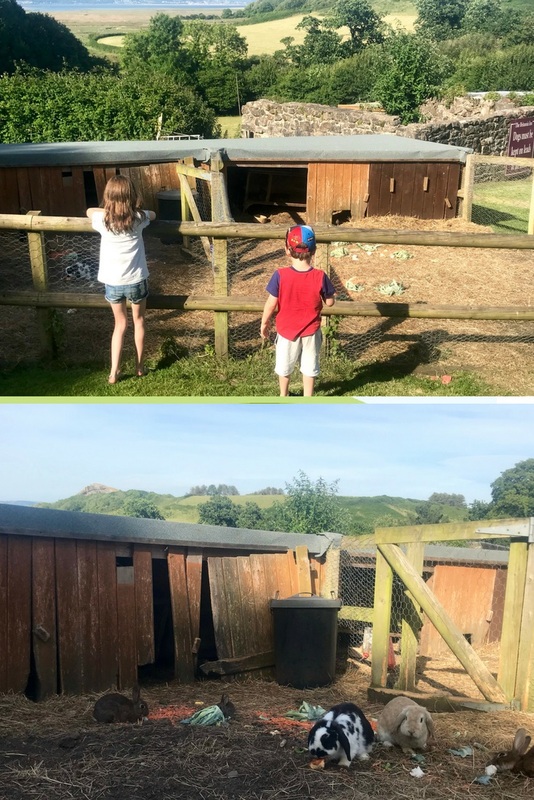 As a family of five, the split accommodation meant that we weren’t all in the same place at night – but it was such a fun adventure that this didn’t bother us at all. On the first night, Cardiff Daddy and our two sons, age 6 and 4, slept in the campervan and my daughter, 8, and I were in the air tent. We swapped around for the second night. Considering how hot it was we all slept remarkably well – perhaps due to all that fresh sea air. But if it had been cold the tent has an electric wood burner effect stove and plenty of extra blankets available. The weather meant we spent most of our time outdoors and Beryl came with a good-sized picnic table plus additional chairs and plenty of room outside for the children to play. 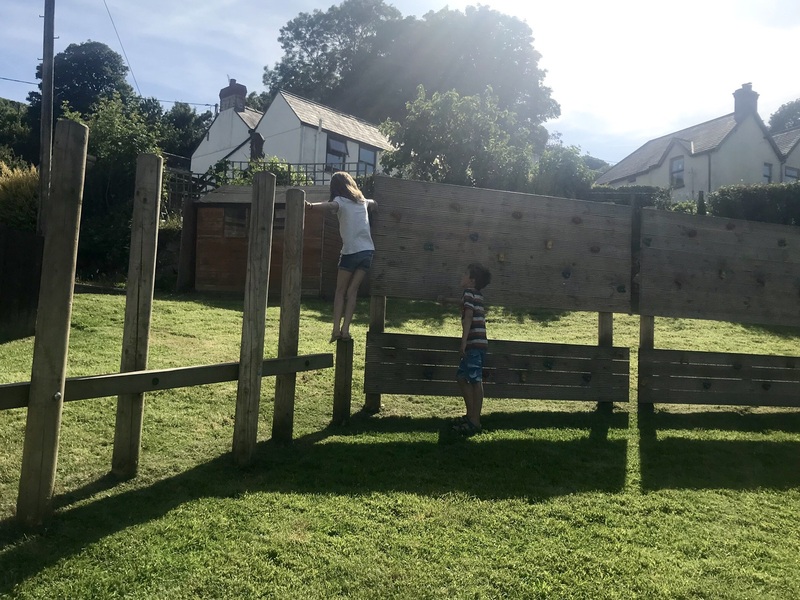 Scamper even have a chest of outdoor toys and games which kept the children entertained – in particular pulling each other around on the grass on boogie boards. 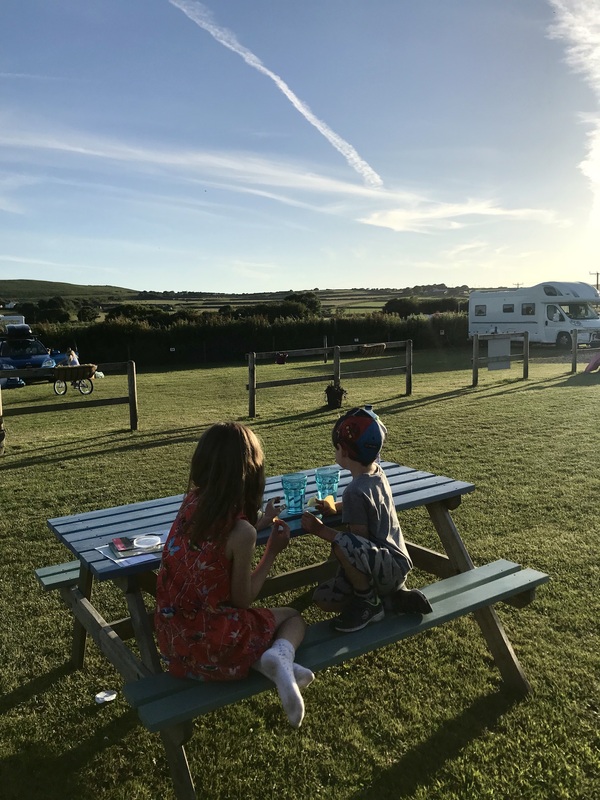 Scamper Holidays has its own section on the much-bigger Kennexstone Camping and Touring Park. 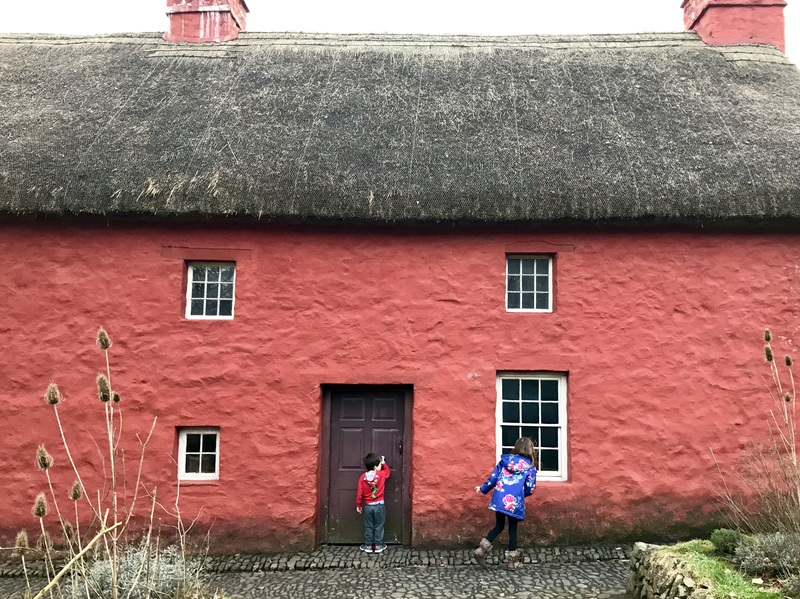 The name Kennexstone was instantly familiar to me as it’s the name of the red farm house at St Fagans National Museum of History, one of our favourite attractions here in Cardiff. I was fascinated to learn that this is the very site where the farm house (pictured below) once stood before being transferred to the open air history museum. Kennexstone is a well-kept site with good clean facilities. The W/C block is well-located so that no one is too far away and there were enough toilets and showers so that we never had to wait. There are shaver points and electric sockets for hairdryers. Importantly the toilets and showers were always clean and fresh-smelling. A separate disabled toilet and wet room (deposit needed for key access) can also be used by families with babies or young children and has an accessible toilet, sink, shower with a seat and a baby changing table. The site has a separate wet suit and surfboard washing area, helping to keep the facilities cleaner. There’s a good-sized washing-up area, a laundry area, and a chemical toilet disposal area. The onsite shop stocks enough of the basics to get you through a couple of days including bread, milk, eggs, burgers and sausages for the barbecue snacks and drinks, ice creams and lollies. as well as gifts and toys. But if you were staying any longer you’d need to venture out to the shops in the local villages. 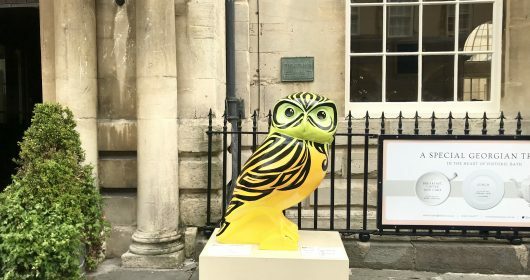 Although it’s a big and busy site, we thought it was well-managed with space between the units, different areas and plenty of green grass and trees creating a tranquil backdrop. It doesn’t have a sea view – but the sunsets against all that green were beautiful. 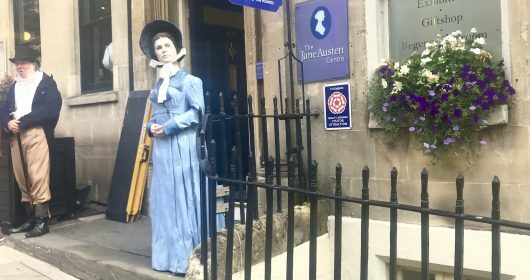 We could only stay for two nights because my children had to get back for school on the Monday morning. But we could quite easily have stayed a lot longer, especially with the hot and sunny weather. I came back to Cardiff feeling relaxed and revived and content that the last weekend of my 30s had been well spent. 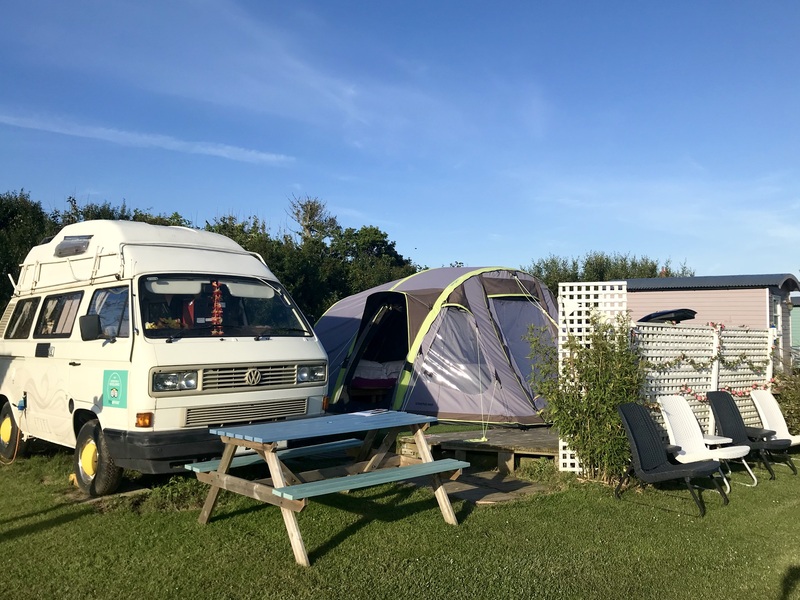 Scamperholidays, Kennexstone Camping and Touring Park, Llangennith, Gower, Swansea, SA3 1HS. 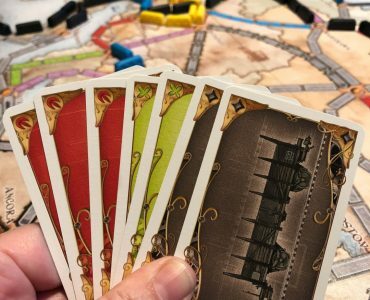 Short breaks cost between £150 and £850 depending on it being peak or off-peak season. 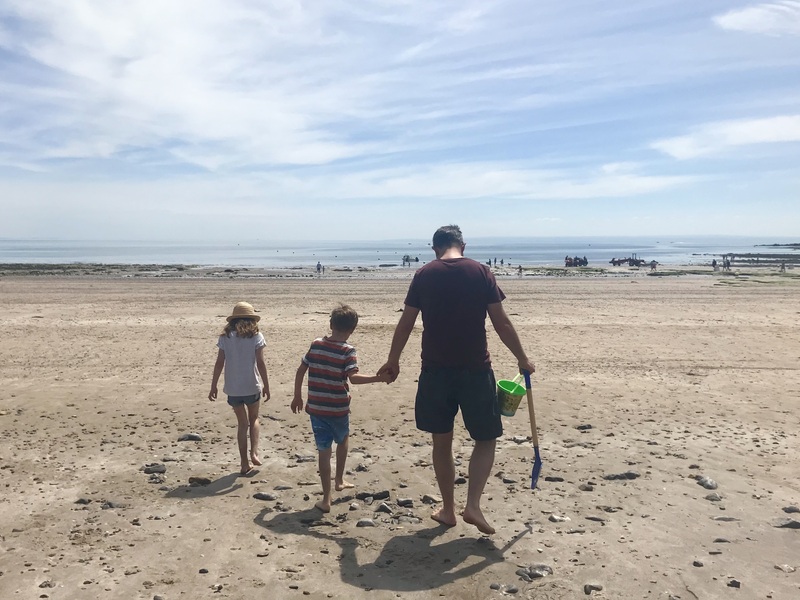 Around a 15-minute drive from our campsite, Port Eynon (SA3 1NN) is a fantastic beach for families. It’s really accessible with good facilities. 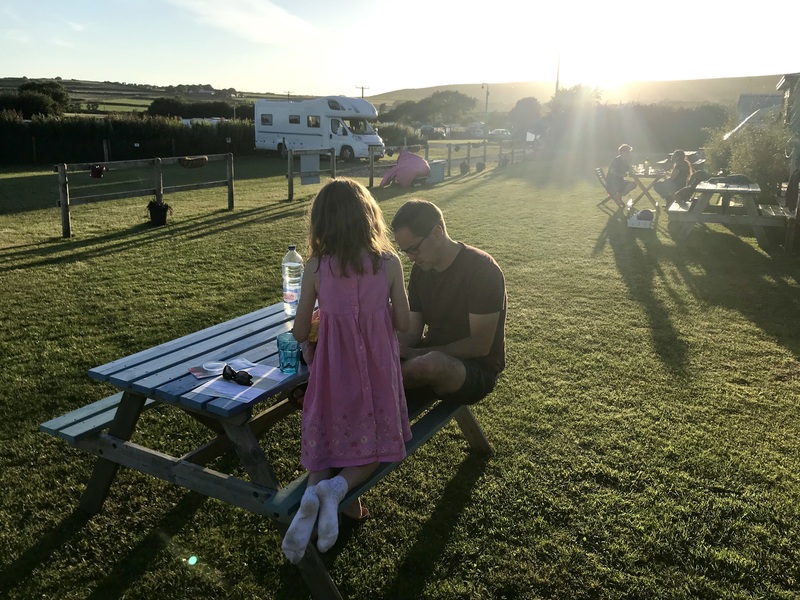 There’s a good-sized pay and display car park next to the beach; toilet facilities; and shops selling drinks, snacks, fish and chips and ice creams as well as beach paraphernalia including buckets and spades. The beach was nicely busy although not jam-packed like our nearest seaside resorts of Barry Island and Porthcawl would be on such a beautiful day. 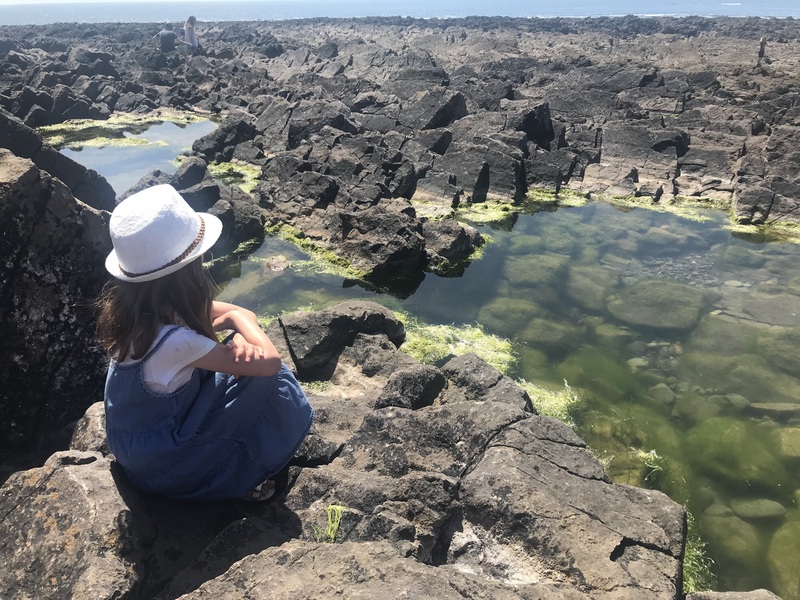 When the tide is out, Port Eynon has plenty of rock pools for children to explore, plus lots of information boards near the shops and toilets detailing the area’s history of smugglers. 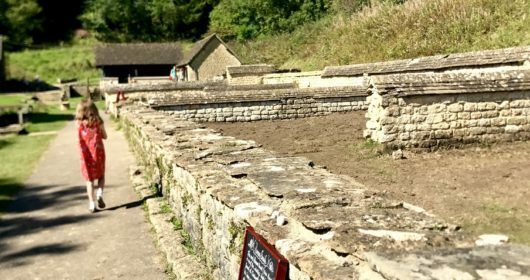 The ruins of the Salt House and Culver Hole are both a short walk away. 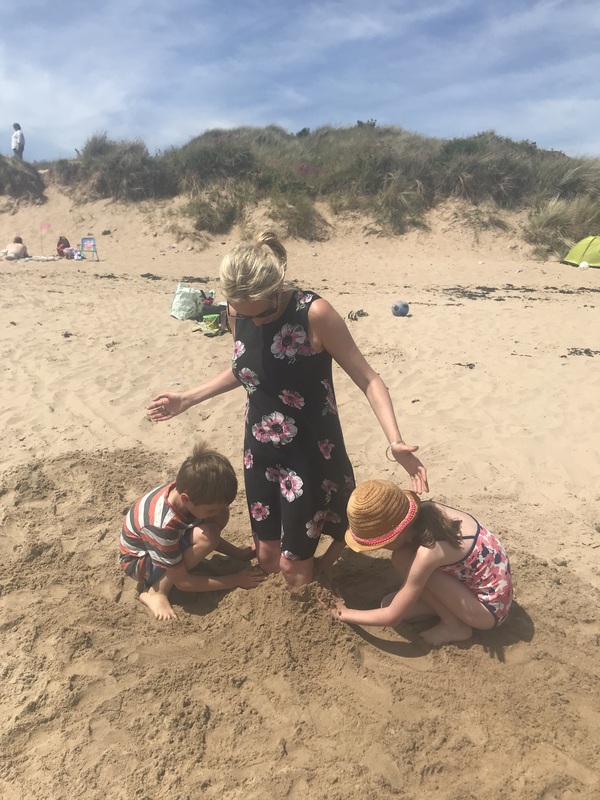 The sand is grainy and coarse with bits of broken up shells and rock so it’s worth taking beach shoes or jelly shoes for children to run around in. 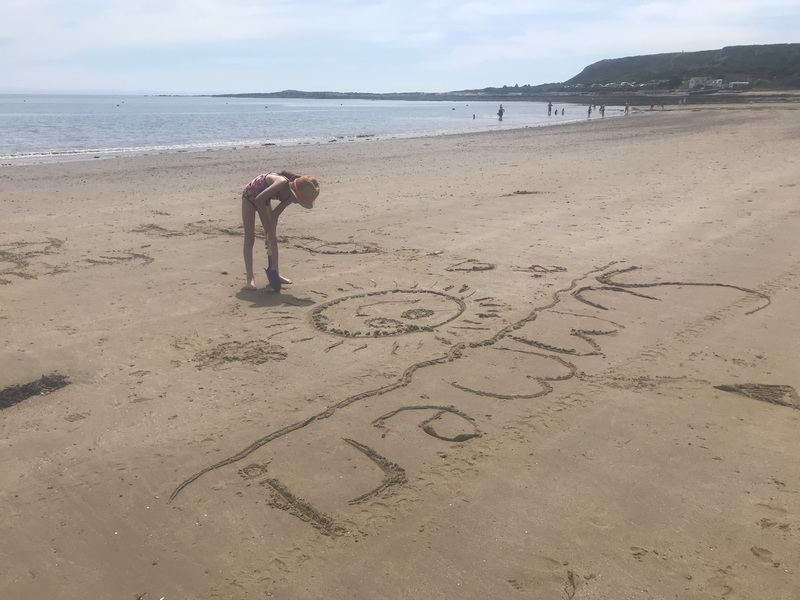 We stopped by the shops on the way to buy a picnic lunch and spent a good five hours on the beach paddling in the water, searching the rock pools, building sandcastles, drawing pictures in the sand and digging holes. My children even buried me up to my knees. 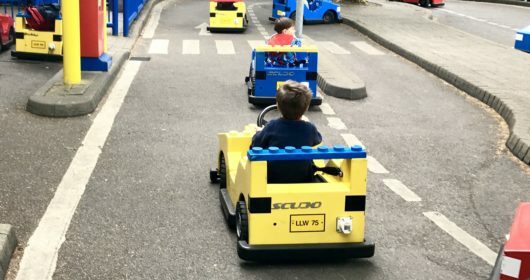 We treated ourselves to ice creams and lollies but other than the parking we didn’t spend any money; just good-old fashioned outdoor fun for free. 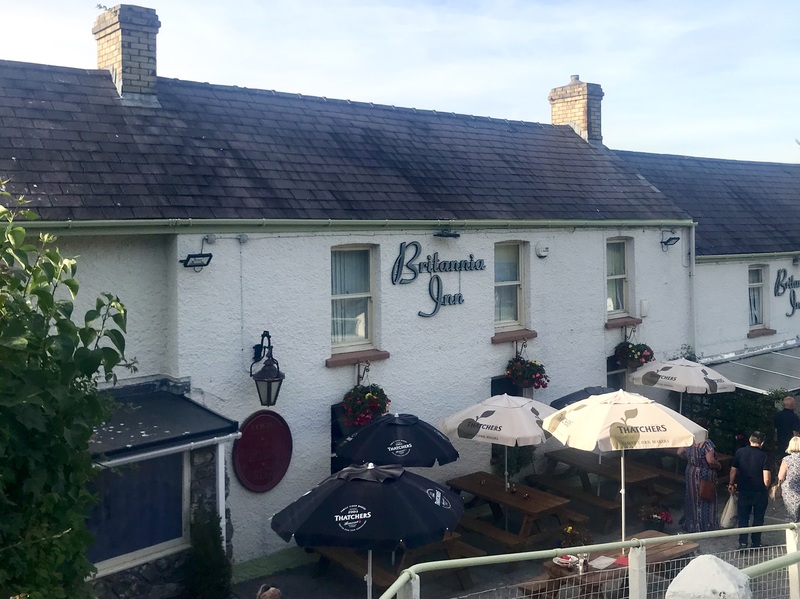 The beer garden at The Britannia Inn is one of the most beautiful I have ever seen. 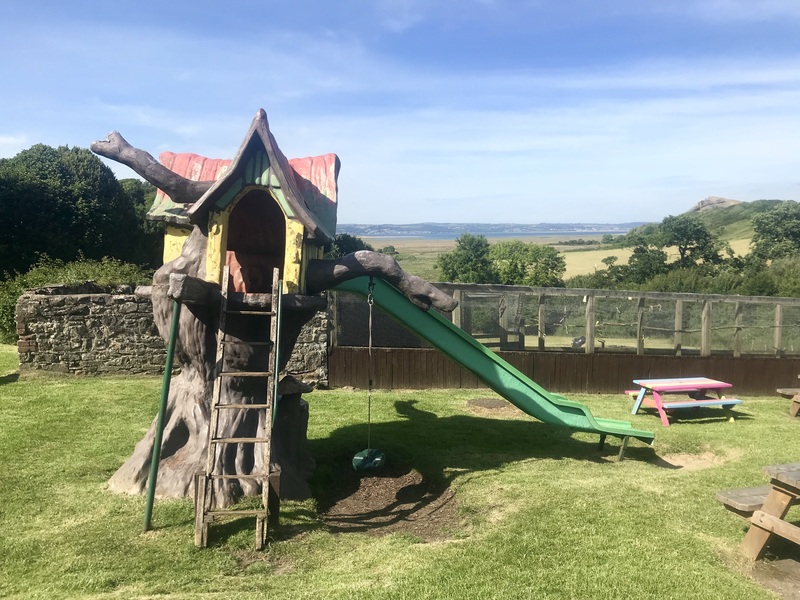 Located in the village of Llanmadoc on the north coast of the Gower peninsular, the views overlooking the Lougher Estuary are stunning. There’s a smaller seating area at the front of the pub but the grassy area at the back is absolutely gorgeous and great for families. 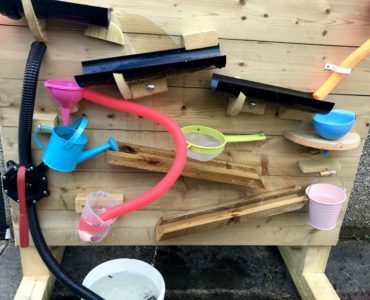 It has a wooden obstacle course; a climbing frame with a slide and swing; an aviary full of budgies, cockatiels, quails and a parrot; and a hutch of rabbits. There’s plenty of space for children to run around while they wait for their food. Cardiff Daddy and I even got to enjoy a birthday drink together in the sunshine while they played. The food was good quality with generous portions. There’s a more expensive menu for the restaurant but there’s also a bar menu for people like us looking for a casual family dinner. Children’s meals cost £3.95 for sausage/chicken nuggets/jumbo fish fingers/cheeseburger and chips; with all but the burger served with either salad, peas or beans. Or it’s £4.95 for fresh hake mini fish and chips; ham egg and chips; or fresh Tagliatelle pasta in a tomato sauce. Adult meals cost between £8 and £15 with options when we visited including steak; steak and ale pie; chilli con carne; lamb tagine; BBQ ribs; fish and chips or a vegetarian/vegan Thai green curry and other options on the special board which included a delicious pea and asparagus risotto. 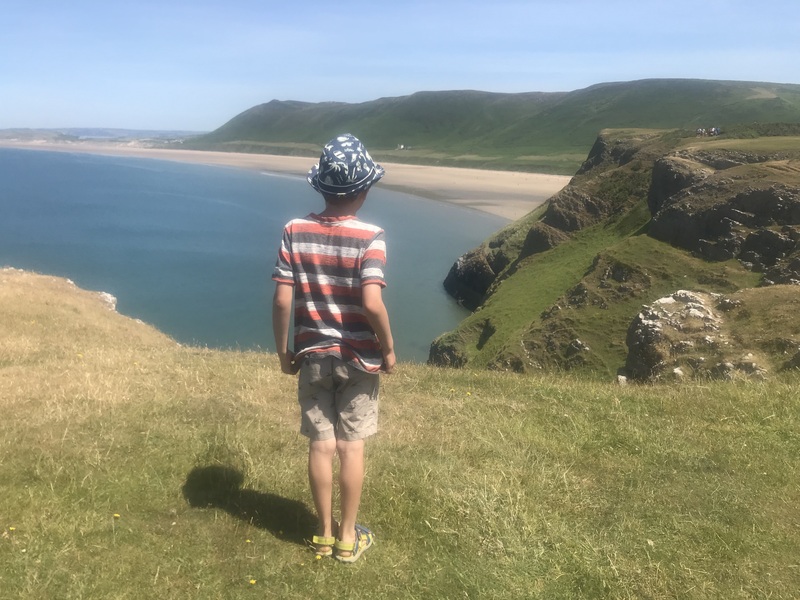 We last visited the beautiful Rhossili Bay back in May (you can read about it here). It’s a stunning beach with a dramatic clifftop backdrop and three miles of sand and coastline. On this visit we also thought we’d also explore Worm’s Head. Its name comes from an old Viking word ‘wurm’ meaning dragon and refers to the serpent-like formation emerging out of the sea. For two and a half hours either side of low tide you can walk across the rocky causeway to the ‘head’. The rocks are big and jagged and it’s not the easiest place to navigate with young children. We didn’t quite make it all the way across but we had good fun searching in all the rock pools and climbing around. It’s definitely a place we’ll come back to explore when the children are older. In the meantime though, the views from the headland out to sea and looking back at Rhossili are incredible. You can read all of our family travel posts here.